There are 22 million old phones in Australia that need to be recycled and kept out of landfill. The Memory Muster is the latest initiative by MobileMuster to collect and recycle these unused mobiles and accessories currently collecting dust at work or home. The first 18,000 people who recycle an old mobile with MobileMuster before 31 December will receive their six favourite pictures as premium postcards to send to friends or to stick on the fridge. To be eligible for the free postcards, each person must recycle their old mobile using a Memory Muster satchel, providing their contact details including an email address and phone number. Alternatively, they need to download a Memory Muster label and insert the label along with their mobile into a padded envelope. Staff can then either drop the satchel or envelope into your workplace collection box or nearest MobileMuster public collection point or they can post it to MobileMuster for free. They will also need to upload their pictures to the MobileMuster website either before or after they send in their mobile for recycling. Terms and conditions apply. Everyone can also enter their pictures into a competition to find the best photos and be in the running for the People's Choice and Ambassador Awards. The winning photos will be exhibited at a gala event in Sydney in early 2013. If your workplace is already registered as a collection point with MobileMuster, you should soon receive an A4 poster to display, some Memory Muster reply paid satchels to give out to staff, and an FAQ sheet to help you answer any questions. If your workplace isn't already registered with MobileMuster,register online now for free and receive a Memory Muster information pack and MobileMuster collection box. To ensure your staff receive their postcards promptly, please book a free pick up each month by calling 1800 249 113. Make sure all the satchels / envelopes are included in the box to be picked up. MobileMuster also accepts mobile phone batteries, their accessories and chargers. Rest assured that any data left on the mobile phone is destroyed in the recycling process. Everything collected will be recycled in a safe, secure and ethical way, with over 90% of the materials returned to the resource stream. Nothing is re-used or re-sold. If you need additional support, more posters or Memory Muster satchels, or have any questions, please call MobileMuster on 1300 730 070 or email mobilemuster@amta.org.au. 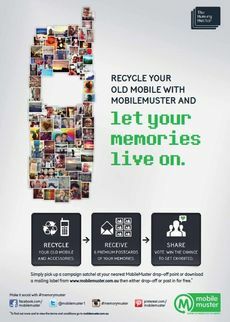 Be part of the MobileMuster promise to keep old mobiles and accessories out of landfill by participating in the Memory Muster and let everyone's memories live on. Visit MobileMuster for a range of workplace recycling options.